Originally named the Ling Shen (Spiritual Immortal) School, The True Buddha School was founded by Master Sheng-Yen Lu in 1975. Born Lian-shen Sheng-yen Lu in Chiayi County, Taiwan, 1945, the master was raised a Christian, attending a Protestant Christian School. His post-secondary education was at Chung Cheng Institute of Technology, and he graduated with a degree in Survey Engineering. In his early twenties he was both a survey engineer and a Sunday school bible teacher. In 1969, at the age of 25, he claims to have had a mystical experience in which he visited heaven for an evening. Following this journey he trained for three years under a formless teacher named "Three-Mountains-Nine-Marquis Xian Sheng." He wrote his first book in 1975. By 1981 he had sought out a total of twenty-one human gurus in Taoism, Sutra, and Tantra. In January, 1981, Master Lu received the "Five Buddha Empowerment" from the 16th Karmapa of the Tibetan Kagyu Sect of Buddhism just before the Karmapa's death that same year (www.tbsn.org). In 1982 Master Lu moved to the United States of America where he studied and meditated rigorously achieving both a mastery of Vajrayana and also enlightenment in 1984. To date, April 2002, he has written 154 books, mostly in Chinese and is currently in seclusion in Redmond where he practices meditation, writes and cooks for himself. His school claims that any yoga he performs manifests a response in the cosmos or on earth. They also believe that his inner world encompasses the Buddhist Tripitaka and the Taoist Knowledge of the Supreme Consciousness of the Universe (www.tbsn.org). The temple is a four-level red brick building. There is an ancestor room in the basement, a worship space on the main floor, kitchen and office spaces on the middle floor, and the two lamas who live on-site inhabit the top floor. On the top floor there are two rooms for public rent to help pay the temple costs. The building is owned by the community as a whole, and does not receive regular monetary contributions from the umbrella organization of The True Buddha School. 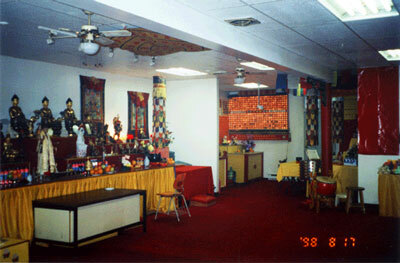 Founded by Master Lian-Tsi in 1990, the Montreal chapter began with a small group of worshippers. The temple was opened in 1993 and was bought by a combination of the community's pooled resources, a subsidy from the main organization, and a generous contribution on the part of Master Lian-Tsi. While she is still the master of the Montreal temple, she has now returned to Taiwan with her husband. She returns twice a year to partake in special ceremonies and check up on the affairs and status of the temple. Her husband runs his own business in Taiwan and, along with helping him, she also runs another temple there. The hierarchy of the organization is ambiguous. At the top is Grand Master Sheng-Yen Lu living in seclusion in Redmond, Washington, U.S.A. He has ordained 64 masters who either reside at a single temple or travel the world facilitating rituals and ceremonies. At present there are 300 chapters and over 40 temples. The main school of learning for lamas, practitioners, and masters is in Redmond. After training, the masters and lamas open a chapter in a city of their choosing or they may sponsor or lead existing temples and chapters. Every temple is individually owned and operated. Every new chapter is responsible for its place of worship, when membership and resources become large enough the community opens a temple. Master Lu has attempted to eschew singular ownership of temples, on his part or on the part of any master. On the real estate papers a temple's owner should read 'the congregation.' His reasoning for communal ownership of temples is to avoid potential conflicts between the goals of the religion and a headstrong landowner steering the temple toward an alternate agenda. Each temple has a patron master and at least one on-site lama. Lama training can take a minimum of 3 months, making sponsor lamas easy to find. There are two types of masters: home and away. The home masters may have families or simply prefer the setting of their town. They remain within driving distance of their temple and travel as little as possible, leaving only for retreats and conferences. The away masters travel almost constantly, performing rituals, giving lectures, opening temples, ordaining lay-practitioners with robes, and performing all other rituals requiring a master. Most of the holidays of the Chan Hai Lei Zang have no official dates, but correspond instead to the schedule of an available master. At the Montreal temple, responsibilities are split between clergy and committee. The clergy are the lamas and master who deal with spiritual and ritual matters. The committee is comprised of committed local members and, though elections are held, all positions are voluntary. This separation is very distinct at the Montreal site, but can be blurred dependent on numbers of people available and interest from the community in taking on such responsibilities. One of the local volunteers told me that the committee was hoping to get a lama from Hong Kong to move into the Montreal temple on a permanent basis within the next two years. This lama, explained the volunteer, would take over the accounting and bill-paying section of the committee's work (April 11, 2002). The volunteer had been in charge of accounting matters for over three years. Besides financial matters, the committee at the Montreal temple also maintains correspondence between the local temple and the Redmond headquarters. There is a weekly newspaper from the headquarters distributed by the local temple. There are also festivities to arrange - new years, autumn and spring, and deity-specific - which are left to the charge of the committee. The committee plans all community celebrations and sets the schedules for visiting masters. Hence, all matters not concerning worship ritual are the concern of the committee. Information on the subsidy of monthly bills, food for the lamas, and maintenance of the building was not available. Though some money is generated from the rental of two rooms on the top floor of the building, donations are also frequent. There is a light board displaying contributions ranging from $10 CDN to $600 CDN. For the 'Ancestor Deliverance' ritual (to be explained later) practitioners purchase placards for $10-$100 dollars. Monthly membership fees were not mentioned. The ordained clergy of the Montreal sight are master Liang-Tsi, Lama Yick-Ming and Lama Lian-Ten. The two lamas live on site and are permanent residents at the temple. Lama Yick-Ming, the older of the two both in ordination and in chronology, is in charge. Incidentally, he too was brought up a Christian. Originally from Hong Kong, he took refuge in Master Lu in 1986. He has been at the Montreal temple since it opened in 1993. Lama Yick-Ming has the highest level of expertise attainable in the organization regarding proper worship practice and ritual process. At the temple, however, he does not regularly lead services. Services are led by anyone in the congregation who knows the chants and rituals, and wishes to lead. While this is sometimes left to the younger lama, most often services are led by a group of lay people. Leadership of rituals is rotated on a bi- or tri-weekly basis. These groups are usually comprised of senior lay people, those who have taken formal refuge in the Buddha or taken a Bodhisattva vow. The congregation at large is comprised predominantly of people aged 30-50, with approximately 10% over the age of 60. Most are immigrants, though not always recent, from Taiwan or China. Few are from Hong Kong. The congregation membership fluctuates, but weekly attendance is between 20-25 members. The language most commonly spoken is Mandarin; prayer is done in Mandarin and Sanskrit. Children are welcome, but usually accompany their parents, and do not partake in worship. Services are held on Saturday evenings at 19:30. There are occasionally Sunday afternoon services, but these are rare. The choice for Saturday evening worship was reasoned by Lama Yick-Ming to be the result of higher attendance rates. I attended three Saturday evening services on February 2nd, March 2nd and March 30th, 2002. These were all regular services, the last of them being in honour of the Grand Master Lu's Birthday. The ritual space is on the ground floor of the temple, pictured below. The floor is covered in red carpet, symbolic of the earth. The main directional focus is north; this is not formal doctrine but a matter of convenience and room shape. Worship takes place on the floor on cushions. The congregation faces the main altar and the leaders of the ceremony, also facing the main altar, are seated at the front of the congregation. There is no set floor plan, nor division of men and women during ritual. Older worshippers, by choice, tend to sit at the back on stools for comfort. The main altar, situated to the north, displays a multitude of deities including the five directional Buddhas, Kuan-yin, Ganesha, and Yellow Jhambala. There are a total of 6 altars in the room from east to west. The first is the altar of the 'Boy of the Year' deity. This deity is changed every year, the cycle renewing itself on 60-year cycle. On the east wall is a light board where members from cities outside Montreal have pledged from $600 CDN for the top level to $10 CDN for the bottom level, their names inscribed accordingly. Behind the "Boy of the Year" deity is a similar wall with names of donors inscribed for good luck that year. Above his head are photographs of all 60 possible "Boy of the Year" deities. 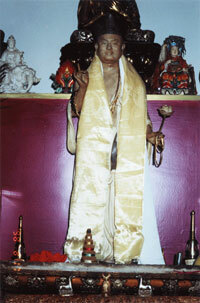 On the right is the "Boy of the Year" deity for 2002 and his altar. 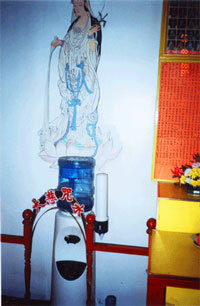 The picture to the left is of a Kuan-yin shrine. The shrine is located next to the "Boy of the Year" and has a standard iconographic representation of Kuan-yin, the Bodhisattva of compassion, holding a vase and a willow branch. She has a water cooler of "pure water" in front of her, and she is worshipped for good health, prosperity and also for guidance by those who have taken the Bodhisattva vow "solemnly promising to work toward buddhahood by following the path to enlightenment" (Oxtoby 221) a Mahayana practice. The inscription above the water tank reads "Great Compassion Dharani or mantra Vow" (Hori) next to the Kuan-yin shrine is a zodiac fortune wheel. The two pictures above are a zodiac fortune wheel (left) and an advice drawer (right). The fortune wheel has an image of each of the characters of the Chinese zodiac. Above each picture is a peg where practitioners may put their names on a placard. The placards become most auspicious when the zodiac year corresponds to one's birth year. Practitioners donate for their name to be placed on the wheel. The placards are burned and replaced monthly. The deities on the poster above the wheel are the protector deities for each zodiac sign. The advice drawer is a common Chinese fortune-telling implement. A practitioner facing a difficult problem will pray to the Amitaba Buddha and then draw a stick from the top of the stand. Each stick has a number corresponding to a drawer, and inside the drawer is the answer to the practitioner's query. The "Boy of the Year," zodiac wheel, and advice drawer are all reminiscent of Chinese folklore and geomancy, while the shrine to Kuan-yin is a Mahayana Buddhist representation. The first three are not necessarily religious implements, are part of no official doctrine, but offer practitioners instant gratification and luck in future endeavours, not to mention minor monetary benefits for the temple. The light board is also a good source of revenue as public displays promote donation from other members. 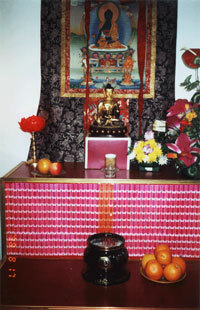 The Kuan-yin shrine offers practitioners a different type of instant gratification in the format of ingesting a pure water blessing, but this is less common, and a more unique aspect of the True Buddha School. Moving westward along the northern wall, the next shrine is that of the Medicine Buddha Sangye Menla. The Medicine Buddha is said to have vowed to "help those who call upon him when ill or injured" and "to aid those who revere him to achieve long and healthy lives" (www.tbsn.org/english/medicine.gif). The True Buddha School explains that this deity, like Amitabha Buddha is the Buddha of the Western Paradise, is the Buddha of the Pure Land Eastern Paradise (www.tbsn.org/english/medicine.gif). This Buddha arises from the Mahayana pantheon of deities. The thangka behind him is a Tibetan iconographic representation (http://www.dharma-haven.org/tibetan/medicine-buddha.htm). Practitioners pray to Medicine Buddha for personal health, or the health of family or friends. He is pictured below in his shrine. The main shrine comprises many deities from a variety of backgrounds. 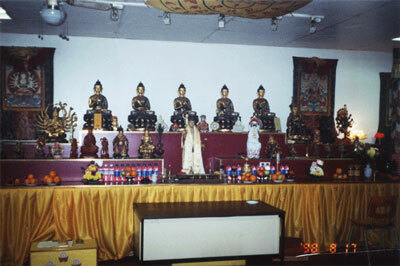 On the back shelf from east, nearest to the Medicine Buddha shrine, to west, nearest to the Maha Cundi statue, are the five directional Buddhas. They are ordered as follows: East, South, Middle, West, and North. In the forefront is a statue of Master Lu. Master Lu wears a yellow scarf, a Tibetan practice; holds his left hand in a mudra, a Vajrayana practice; holds a lotus in his right hand, a standard feature of many Buddhist schools; and has stupas to his right and left, the Tibetan image for the feminine. At his feet are the offerings of the clergy and lay persons. The stature is pictured at the top of the next page. 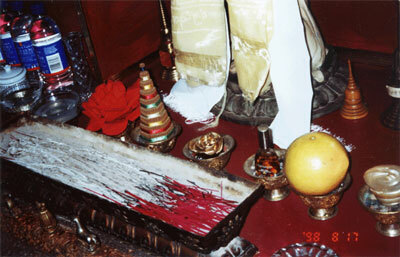 The lower picture on the preceding page is a close-up of the offerings at the feet of Master Lu. Outside of the frame, to the east of the orange, was a small glass of wine. From east to west the offerings include: a small shell-shaped candle, an orange representing gold, a bottle of nail polish, a golden rose, a turret, a lotus shaped flower and water. The orange, turret, lotus and water are very standard deity offerings from the Mahayana tradition. The wine offering is reminiscent of some rare tantric practices, but is an uncommon offering in orthodox Mahayana and most Vajrayana temples. The golden rose, though unusual may be an extension of Mahayana practice, while the nail polish is a modern-day adaptation with no historical rooting in Chinese religious traditions. The incense at his feet are a very common Buddhist motif, and the lamas burn incense twice daily. To the east of the Master Lu statue is a deity whose principle function is to help with monetary matters. "Yellow Jambhala," pictured on the next page, is one of the True Buddha School's deities for worldly or mundane practices. The small pyramids in front of him represent wealth. Master Lu reasons that " some material resources are needed in order to devote one's time and mind whole-heartedly to the cultivation practice," and that "financial resources are needed to complete many worthwhile projects." Master Lu recommends "making offerings to the Yellow Jambhala, and holding a wish that he [Jambhala] be freed from his suffering and become a Buddha," (www.tbsn.org/english/intro/yellow.htm) to gain assistance regarding financial and material problems. This is one point on which the True Buddha School diverges sharply from standard Buddhist teachings. In this instance the lesson of non-attachment is momentarily compromised in order to bring about the long-term effect of enlightenment. The philosophy behind such a move is to satisfy earthly desires - to quell the need for temporal success - so that one may concentrate on achieving the higher success of buddhahood (Questions and Answers on the True Buddha School 6). 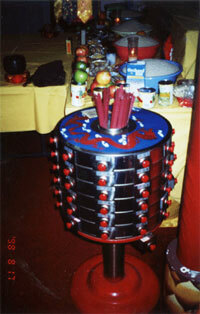 The implements to the east of the Yellow Jhambala are two Tibetan Buddhist implements: a vajra and a dorje. Both are used during worship services. 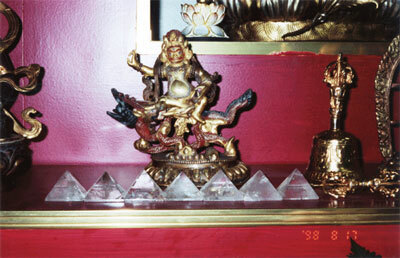 The vajra, lying flat next to the pyramids, is a symbol of the masculine. 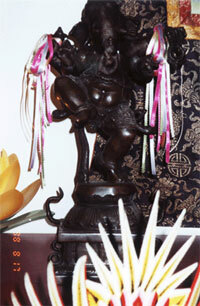 The dorje is a symbol of the feminine. Though Master Lu recently forbade any practitioner from attempting the "cultivation of Twin-body Yoga with a physical consort" (www.tbsn.org/english2/ news.php?id=1&classid=1#), there is a subtle reference here to the Tantric practices of Vajrayana Tibetan Buddhism. Situated on the main shrine immediately to the west of the Buddha of the North is the Maha Cundi Bodhisattva. 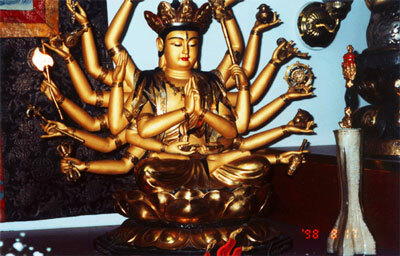 Known as the "Mother of Buddhas," her many implements represent a variety of skillful means (www.tbsn.org/english/intro/maha.htm). 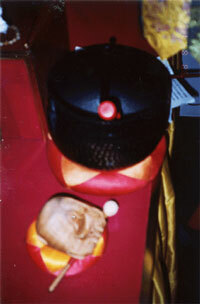 Some of her implements include a vajra, stupa and karma wheel. She is a Tantric goddess from a branch of Vajrayana (www.magickalcauldron.com /library/buddhist.html). This is reinforced by her use of mudras. Mudras, manipulations of hands into specific positions, are a visualization tool used for meditation in Vajrayana Buddhism. Next to her (to her eastern side) is a statue of the Hindu god Ganesha. Known in Hindu mythology as a destroyer of obstacles and deity of knowledge, wisdom, fortune and the fine arts (http://www.cix.co.uk/~ganesh/ganesha.htm), Ganesha is seen in the True Buddha School of thought as a protector god of Master Lu. This is another interesting point of syncretism in the True Buddha School's pantheon of deities. Ganesha is a very popular deity in the Hindu tradition and is worshipped for success at the outset of any venture. His incorporation into the True Buddha School's pantheon is of double significance as it points to the necessity for mortal and material satisfaction while simultaneously asserting the supremacy of the religion's leader. He is pictured below on the right. Pictured left on the previous page is the shrine of the local deity of Montreal. Located in the furthest the eastern corner of the ritual space, this deity is exclusive to the Montreal temple. Known as the "Mayor of Montreal," Lama Yick-Ming explained this deity as being entrusted to protect the congregation and the temple. Each temple has a deity similar to this one its role, but individual in its name and look. The statue next to the Mayor of Montreal was referred to as a "Glang God;" my understanding of the name may be flawed. This deity's origins are Taoist and his primary concern is protecting the temple and the land it is on. On the ceiling is a flag with a Taoist representation of the universe. 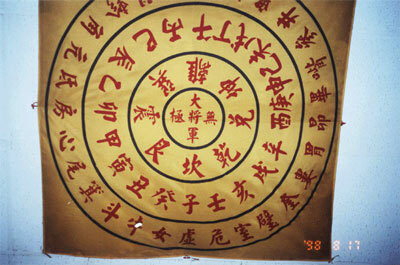 On the inner most circle is inscribed "The Banner of Ultimate Nothingness" (Hori). This decree is meant to correspond to Master Lu's inner being which encompasses the Supreme Consciousness of the Universe, making him a master of the Tao. The second ring contains the 8 trigrams of Fu-Shi, "symbolic of the heavens, the abode of the eternal Tao" (Saso 400). The third ring represents the 10 heavenly stems inserted between the 12 earthly realms (Hori). The 12 stems correspond to the concept of the five elements. Multiply 12 by 5 and the product is 60. There are 60 days in the ancient Chinese week, and the "Boy of the Year" deities follow a 60-year cycle. The fourth ring, the most outer, comprises the 28 lodges (Smith 371-4). This depiction hanging over the heads of Buddhist practitioners correlates to the Chinese All-in-One One-in-All philosophy of bringing together Confucian teachings with Taoism and Buddhism (Chan 64), a syncretic belief system in harmony with that of the True Buddha School. The "altar for the dead" whose function I did not witness is a temporary, seasonal altar. 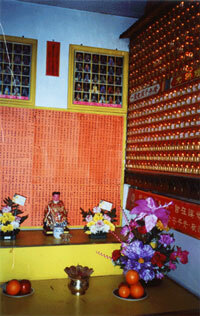 It was setup across from the "Boy of the Year," Kuan-yin, and zodiac wheel altars. On its top shelf are five major deities and the names of practitioners' ancestors are inscribed on the placards below. The deities from right, above the red rice bowl, to left, above the green rice bowl, are Wei-T'an, Maha Cundi, Padmakumara (Master Lu), Kishitigarbha, and Cha-Lan (Guan-gong). These deities arise out of Chinese folk religion, Tibetan Buddhism, True Buddha School, and are reminiscent of the Bodhisattva of hell and a Japanese warrior god. Each placard ranges in price from $10 CDN to $100 CDN and is burned at the end of the ceremony. The ceremony for which this altar is used is the first of a two-part ritual of deliverance and blessing. In the spring the ghosts of ancestors are blessed, deliverance incorporated into the blessing. In the autumn, the time of many hungry ghosts, deliverance takes place, with a blessing incorporated as a minor part of the ritual. Charles Orzech explains, "The Ghost Festival of the 7th month of the Chinese lunar calendar�is the second most important festival of the year" (278). This ritual is an odd addition to the True Buddha School. Orthodox Buddhist belief, particularly well illustrated in the Tibetan Book of The Dead, is that every soul is reborn after spending 49 days in the afterlife. The question left unanswered: why would one's ancestors require deliverance? One possible answer is that during their 49 days in the afterlife they fell victim to the temptation of the hungry ghost deity. Now trapped in the between world, always hungry and wanting, but never achieving fulfillment, they would require the aid of loved ones to proceed to rebirth. The leaders of a Saturday evening worship, as previously mentioned, are longstanding members of the lay community, or the lamas. For two out of the three ceremonies I attended, the leaders were community members. Ceremonial dress is optional for lay people, but is not optional for the lamas. The lamas wear Vajrayana-style mauve robes and tunics, similar to the attire of Dalai Lama. Lay people wear bright orange robes a Theravada tradition, and those who have taken the Bodhisattva Vow wear an additional brown net-like sash over top of their orange robe. The lamas are looked to for appropriate mudras and postures. The ritual leaders for the service sit in front of the practitioners, and everyone faces the main altar. The worship rituals comprise a number of mantras, chants, songs, recitations and prostrations. Accompanying most of these are musical implements including bells, drums, symbols and a wooden fish. 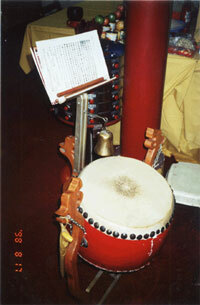 The two photos show the drum, right, and bell, left, common to a variety of Asian temples. These are the most frequently heard musical implements during the worship ritual. 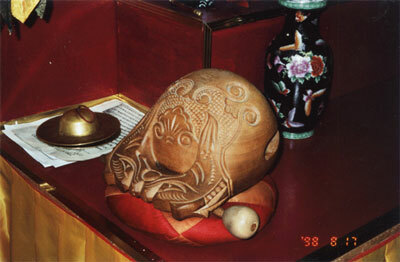 The wooden fish, in the same picture as the black bell, is a standard implement in Asian religious ceremonies. Below is a picture of a bell and symbol. The former is a standard Chinese implement, the latter of Tibetan, Vajrayana, origin. Like so many aspects of the True Buddha School, syncretism prevails; musical implements not excluded. The process of an evening's ritual worship is detailed in a manual written by Master Lu. Beginning with the burning of incense and proceeding through a recitation of Master Lu's "Pure Dharma Body Buddha" mantra, the Amitabha is called upon to bless the evening's events. The next mantra is directed to Kuan-yin, "The Great Compassion Dharani." After these Mahayana-type rituals, the worship moves through a number of Vajrayana techniques including mudras alongside Tibetan chanting of "Namo�[varying deities]". Visualization, another Vajrayana concept, is also used at this point to aid the practitioners in focussing their attention on the Master and his teachings. Following the main visualization portion of the ritual, Sutrayana is used in the form of the "True Buddha Sutra," a teaching said to blow out temporal concerns and bestow good fortune on the practitioner (True Buddha Group Practice Text 7). This sutra is ended with an interesting twist on a standard Vajrayana mantra. The line is "Om, guru, Lian-shen siddhi, hum" (True Buddha Group Practice Text 16). Where one would commonly find the name of a deity, the Master's name is here inserted. Next a Sutra honouring Avalokitesvara (another name for Kuan-yin), the Bodhisattva of compassion. After this is the "Rebirth Mantra," requesting the gods' assistance to control one's own birth and death: a very common thread in Buddhist thought. This mantra is repeated 7 times. Mudras and recitations follow and are specifically directed to Padmakumara, of whom Master Lu claims to be an incarnation. A heavily Vajrayana-influenced series of mudras and visualizations are here employed. The tenth point in the worship ritual is a Taoist practice of "Nine Round Breath and Entering Samadhi" (True Buddha Group Practice Text 20). Reminiscent of the Taoist practice of Internal Alchemy, the text also offers an optional "Internal Fire Practice." The practice involves proper posture, visualization, and an opening of internal channels for increased flow of "qi," "the universal energy/matter/fluid of which all phenomena in the universe are constructed; both the physical and the psychological," (Roth 125) and the strengthening of Mai, or vein. This syncretism Taoism and Tantrayana Buddhism falls inline with Master Lu's definition of his religion as one of cultivation (Questions and Answers 9). The final mantras incorporate an incantation to the 8 main deities of the True Buddha School's pantheon: Amitabha Buddha, Avalokitesvara Bodhisattva, Ksitigarbha Bodhisattva, Medicine Buddha, Yellow Jambhala, Padmasambhava and Master Lu's incarnation: Padmakumara. The ritual ends with a Vajrayana standard "Om Mani Padme Hum" (True Buddha Group Practice Text 23). Unlike many other sects of Buddhism no meal was provided after the ritual service, a light snack was sometimes available. Most people chatted briefly with each other over tea before leaving. The building was usually clear within 30 minutes of the service's end. His argument is that religions are segregated and regional because of a lack of ability to transmit their messages earlier on to more people. As all paths to enlightenment result in the same achievement, Master Lu argues that his method amalgamates these paths to achieve control over one's birth and death in the most efficient way possible. Because the True Buddha School is a relatively new religion, and one that attempts a syncretism of so many other traditions, formal and informal doctrine are difficult to distinguish. Each temple is individually owned and operated. The name of each temple is not necessarily the same. While all practitioners use similar manuals, the emphasis on Vajrayana or Mahayana or Taoism varies. The leadership of worship also varies. Some temples use lay people, others only lamas. Even holidays are without permanent dates. 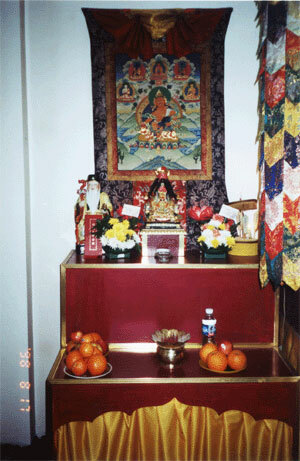 For example, the Montreal temple decided to hold a special worship ceremony to venerate the "Golden Mother" or Maha Cundi, the reason being that a Master from Vancouver had arrived to perform a spirit blessing and deliverance, and the lamas felt that such an occasion merited a special worship ceremony. One point of clarity within the school is its goals. The True Buddha School wishes "to help sentient beings attain Buddhahood in this life, by realizing the One Mind and Original Nature, and to help one become a master of one's own birth and death" (Questions and Answers 3). These goals refer to a Buddhist level of enlightenment combined with a Taoist philosophy of origin, a mixture of impermanence and permanence common to Chinese forms of Buddhism. Another point on which the teachings are clear is that one must take refuge in the Living Buddha Grand Master Lian-Sheng. After accepting that Master Lu is the incarnation of Padmakumara, one may proceed to train in the methods of self-cultivation. The next steps are to quell from the mind unnecessary thought, and then to coordinate one's breath with the mantra "Om, Ah, Hum." Four preliminary methods of cultivation are contained in the "Four Foundational Yoga." After achieving this low level of cultivation, one proceeds through "The Guru Yoga," the "Personal Deity Yoga," the "Dharma Protector Practice," and finally the "Highest Tantra Practice" (Questions and Answers 10). There are also expedient practices concerned with mortal affairs such as the "Practice for Prosperity" and the "Healing of Illnesses Yoga." In short, once one has conquered their temporal concerns, it is a four-step program to the path of enlightenment culminating in taking the Bodhisattva vow. There are two main steps to the process as a whole. The first goal is mind and body cultivation. Through cultivation one's final aim is the "Rainbow Light Great Attainment," describing a person who is able to "release the energy force from his body through spiritual cultivation" (http://www.tbsn.org). During this cultivation process, Master Lu promises that the practitioner will "be able to really feel 'something' - an invincible power, collectively known as 'Dharma Power'" (http://www.tbsn.org). Once this is achieved the second step is the melding of the practitioner's mind and body. Achieved as a natural consequence to the first step, one's mind and body are thenceforth in coordination with the greater cosmos. The ease of this process, claims Master Lu, is why Tantrayana is truly the perfect method for cultivation, higher than Zen, Sutrayana, Mahayana, Vajrayana, and Taoism, because it incorporates them all (http://www.tbsn.org). You do not practice vigorously; and are slackening in your effort. You lose the right thought, have deviated, and full of crooked ideas and behaving abnormally. You lose the lineage's energized power (http://www.tbs.orvg). These are very similar to the Western Biblical motif of keeping within the Grace of God. The way to maintain that grace, according to the True Buddha School, is through an amalgamation of Buddhist and Taoist practices. Lastly, the True Buddha School does not prohibit the consumption of alcohol or meat. The consumption of alcohol is limited to quantities not resulting in intoxication, and the eating of meat is restricted to animals not butchered especially for the person consuming. Before consuming either of these, or any other nutritional substance, a special prayer is required. For meats, the spirit of the animal must be delivered. Informal points to the doctrine include geomancy in the form of Feng-Shui and spirit-board divination. The former is illustrated by a belief in the importance of open pathways for energy to enter and leave a premise: home, business or temple. The latter is used in the blessing and deliverance ceremonies for hungry ghosts. Both are common in Chinese folk religion. Other informal practices include the "Boy of the Year" worship, the advice drawers and the zodiac wheel. Education is separated into two categories: schooling for lamas and masters, and retreats for lay people. Lama training takes three months and is held in Redmond. Master training requires more time and proof of devotion to Master Lu's teachings. Masters ordination occurs as the result of exemplary behaviour over an unspecific amount of time. The one master I spoke with took refuge in 1986, and worked at Master Lu's side for an undisclosed period of time. An away-type Master, he was based in Vancouver. Within the four months prior to my interview with him, he had traveled to The United Kingdom, Malaysia, Taiwan, Hong Kong, China, Singapore, and throughout the United States and Canada. The retreats for lay people are held primarily in Redmond, and occasionally at other locations corresponding to demographic need. According to the web site, the most recent retreats have taken place in Seattle, New York, Malaysia and Taiwan. These retreats offer practitioners the opportunity to study under the advice of ordained Masters, and are one of the most common times to take refuge or the Bodhisattva Vow. The final method of education available to all is the literature produced by Master Lu. To date, he has published 154 books, all in Mandarin. Translations are available in a languages including, but not exclusive to, English, Spanish, Indonesian and French. The web-site, www.tbsn.org, is regularly updated, available in all the aforementioned languages, packed with information, and very user friendly. Master Lu's alignment with the process of inner cultivation is a known method of syncretic belief systems. Harold Roth, "Inner Cultivation Tradition of Early Daoism," described the practice of inward discipline followed by the early Taoists as "essentially apophatic�a systematic process of negating, forgetting, or emptying out the contents of consciousness found in ordinary experience that is based in the ego-self" (125). The result of said practice is the removal of self-consciousness by breaking ties with ones perceptions, emotions, desires and thoughts: in short the "Rainbow Light Great Attainment." Continuing on the Taoist trend salvation, as explained by the earlier Buddhist teachings, was the hard-won fruit of countless incarnations during which the "aspirant disciplined himself to extinguish the passions tying him to the flux of existence" (Thompson 115). This Mahayana ideal is reflected Master Lu's main goal of mastering one's birth and death. Thompson, Chinese Religions: An Introduction, goes on to explain that the Mahayana, or Madhyanika, dialectic destroyed the possibility of any ultimate "reality" to which one could cling. Mahayana and the True Buddha School here converge from Taoist routings, as Master Lu claims that one's ultimate destination is the Pure Land Western Paradise. Thompson claims that within Chinese religion, there are three main paths to enlightenment: the Taoist Tradition, the Literati Tradition, and the Buddhist Tradition. Master Lu extends this thesis to include Christianity, appealing to the cultural sensibilities of the Chinese and simultaneously to Western religious ideals. Lay persons frequently banded together in religious societies which would sometimes become identified as sects�The religious teachings of societies and sects would range from lay devotees' vows of Buddhism or Taoism to the most ludicrous rantings of self-proclaimed prophets" (128-129). The focus on lay people's involvement in every aspect of The True Buddha School, from committee to worship, seems to assert this claim. Thompson's last sentence is noteworthy in its illustration of criticism received by the True Buddha School from the orthodoxy. 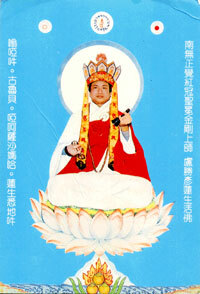 To a superficial observer, modern Chinese Buddhism must present an ugly picture of superstition, magic and idolatry�[since] in actual practice he [the practitioner] meditates according to the traditions of the Ch'an School and follows the Pure Land Custom of reciting the holy name of the Buddha�In the Ch'an mystical and disciplinary schools, salvation is achieved "in this very body" and one can and should "become Buddha where you are" (54, 64, 82). Any pointing of fingers regarding the lack of "true Buddhism" in the True Buddha School would be a rather bias value judgement from any standpoint as many of the preceding are incorporated in Master Lu's teachings and all are part of the orthodoxy. While the Montreal temple does not involve Shingon in their rituals the rest of Mclellan's assertion is an excellent synopsis of the influences pervading the True Buddha School. The recent and widespread occurrence of cults and sects in Chinese religions is testimony to the people's longing for material and spiritual salvation. Master Lu's True Buddha School philosophy is a response to those needs. I wish to extend my thanks and gratitude to Yick-Ming Farssu, Dr. Victor Sogen Hori, Mr. Colin and Master Tige Chiu for their time, patience, assistance and energy regarding this project. Creel, Horrlee. What is Taoism?. London: University of Chicago Press, 1970. Lu, Sheng-yen. "A Religion of the World," The True Buddha Way. Redmond: The Rey Tseng Temple, 1985, 107-111. Lu, Sheng-yen. "Who Am I really?" Montreal, distributed by Chan Hai Lei Zang. Mclellan, Janet. "Chinese Buddhists in Toronto," Many Petals of the Lotus. Toronto: University of Toronto Press, 1999, 159-189. Orzech, Charles. "Saving the Burning-mouth Hungry Ghost." In Donald S. Lopez, Jr. (ed.) Religions of China in practice. Princeton: Princeton University Press. Pp. 278-283. Paper, Jordan. "A Note on Contemporary Religion in Taiwan: Domestic Architecture." Journal of Chinese Religions, No. 24, Fall 1996, 101-104. Paper, Jordan. "Mediums and Modernity: the Institutionalization of Ecstatic Religious Functionaries in Taiwan" Journal of Chinese Religions, No. 24, Fall 1996, 105-130. Pas, Julian F. "Religious Life in Present Day Taiwan; a Field Observations Report: 1993-1994." Journal of Chinese Religions, No. 24, Fall 1996, 132-150. Purple Lotus Society (ed.) Questions and Answers on the True Buddha School. Redmond: The Rey Tseng Temple, 1993. Roth, Harold D. "Inner Cultivation Tradition of Early Daoism," Lopez, Donald S. Jr. (ed) Religions of China in Practice. Princeton: Princeton University Press, 1996. Saso, Michael. "What is the Ho-t'u?" History of Religion 17:3-4, Feb.-May, 1978: 399-416. Smith, J. Fortune Tellers And Philosophers. Boulder: Westview Press, 1991. Wing-tsit, Chen. Religious Trends in Modern China. New York: Octagon Books, 1969. 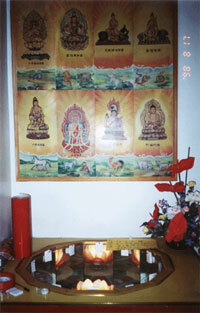 Interview with Lama Yick-Ming, February 13th, 2002. Interview with Lama Yick-Ming, February 21st, 2002. Interview with Lama Yick-Ming, April 8, 2002. Interview with Professor Hori regarding explanation of photographs, April 10, 2002. Conversation with Mr. Colin, April 11th 2002. Interview with Master Tige Chiu, April 13, 2002.